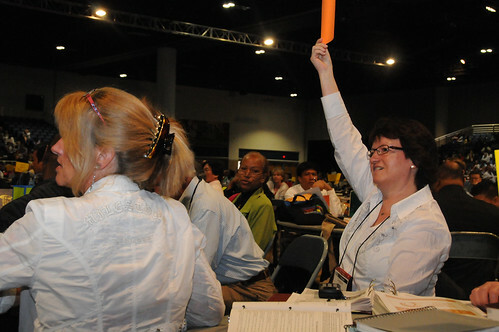 Christine Schneider, Switzerland-France-North Africa, seeking to be recognized during the debate over the role and support of the president of the Council of Bishops, at the 2012 United Methodist General Conference in Tampa, Fla. A UMNS photo by John C. Goodwin. Jan Love, the Rev. Kasap Owan, the Rev. William J. Abraham and the Rev. Bill T. Arnold were elected to the University Senate during the April 30 morning session of the 2012 United Methodist General Conference. The University Senate comprises 25 voting members who at the time of election are actively engaged in the work of education at an educational institution. The four will serve four-year terms. Love, dean of Candler School of Theology, and Owan, president of Katanga Methodist University, were elected to fill the role as chief executive officers of United Methodist-related institutions. Abraham, professor at Perkins School of Theology, and Arnold, former provost of Asbury Theological Seminary, were elected to fill the roles of other positions relevant to academic or financial affairs or church relationships. The University Senate, established in 1882, is one of the oldest accrediting bodies in the United States. Its mission was to ensure that schools, colleges and universities related to the church were worthy of carrying the denomination's name. In recent years, regional bodies have accredited academic institutions, and the senate has focused more on how institutions are related to The United Methodist Church. The 25-member body of professionals in higher education has responsibility for supporting the development of institutions whose aims are to address significant educational, cultural, societal and human issues in a manner reflecting the values held in common by the institutions and The United Methodist Church. Nominations to the University Senate come from the National Association of Schools and Colleges and Universities of the denomination, United Methodist Board of Higher Education and Ministry, General Conference, Council of Bishops and the University Senate itself. News media contact: Kathy L. Gilbert, Tampa, Fla., (813) 574-4837, through May 4; after May 4, Nashville, Tenn., (615) 742-5470, or newsdesk@umcom.org.